The Grinch (voice of Benedict Cumberbatch) is a cynical grump who likes to bring misery to people's lives. He routinely goes into Whoville to do mean things, spreading ill will wherever he goes. 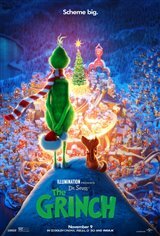 When the inhabitants of Whoville decide to make their Christmas celebration three times bigger than it's ever been before, the grumpy Grinch decides to dress up as Santa, with his faithful dog Max posing as a reindeer, to steal Christmas right out from under their noses.